4.11. Nurses play a key role in delivering person-centred care in all parts of the NHS and have been the largest clinical workforce since 1948. Global demand for nurses remains strong and, while UK-based training is an asset, we are not yet training sufficient nurses to meet demand. 4.12. The NHS Improvement-led workforce group will agree action to improve supply over the course of the Long Term. This will centre on increasing the number of undergraduate nursing degrees, reducing attrition from training and improving retention, with the aim of improving the nursing vacancy rate to 5% by 2028. 4.13. The NHS remains a highly attractive career choice. 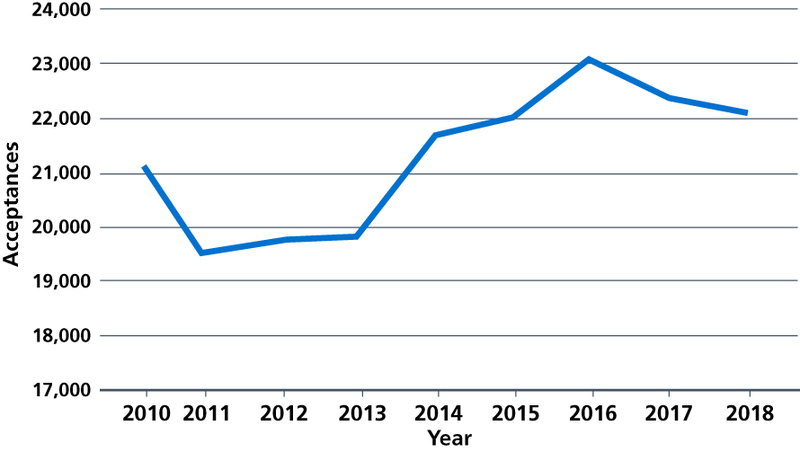 The main source of new nurses is through undergraduate education and, while other routes are important, restoring growth in this route is central to the success of the Long Term 22,200 applicants were accepted onto English nursing courses in 2018, a higher number than in seven of the last ten years. And while the total number of applications fell, there were still nearly two applicants for each place offered . Source: UCAS. Applications and acceptances. 2018. 4.14. However, across the UK, 14,000 applicants to nursing were not accepted onto courses. At a time of staff shortage across the NHS it is – to say the least – paradoxical that many thousands of highly motivated and well-qualified applicants who want to join the health service are being turned A number of Higher Education Institutions (HEIs) have entry tariffs well above the levels set by other HEIs and deemed to meet appropriate standards by the Nursing and Midwifery Council . In other cases the rationalising factor has been that HEE hasn’t been able to guarantee the clinical placements needed to give hands-on experience. Both reasons now need to change. 4.15. To facilitate the Department of Health and Social Care’s intended 25% increase in nurse undergraduate places, clinical placements for an extra 5,000 places will be funded from 2019/20, a 25% From 2020/21, we will provide funding for clinical placements for as many places as universities fill, up to a 50% increase. And every nurse or midwife graduating will also be offered a five-year NHS job guarantee within the region where they qualify. 4.16. We also need to make training more accessible. We will establish a new online nursing degree for the NHS, linked to guaranteed placements at NHS trusts and primary care, with the aim of widening participation. This could be launched from 2020 depending on the speed of regulatory approvals. And to both minimise student debt and incentivise mature applicants, it will be offered for substantially less than the £9,250-a-year cost to current students. 4.17. Mature students are more likely to have family and other commitments that make it harder to retrain without financial support. This has particularly affected mental health and learning disabilities fill rates – key priorities for the NHS. This is why ‘earn and learn’ support premiums for students embarking on more flexible undergraduate degrees in mental health or learning disability nursing, who are also predominantly mature students will be explored, with the aim of having an additional 4,000 people training by 2023/24, supported by the increased funding for clinical placements. 4.18. Apprenticeships offer important opportunities for widening social participation in the NHS workforce. They also provide career ladders for staff to develop their skills, expand the contribution they can make to patient care and strengthen their commitment to continue working for the NHS. NHS organisations should look to take on the lead employer model, setting up the infrastructure to deliver apprenticeships on behalf of several trusts, and providing training and education. We will continue to invest in the growth of nursing apprenticeships with 7,500 new nursing associates starting in 2019, a 50% increase on 2018. We will also provide the necessary investment in training to create meaningful career ladders for these staff to develop and progress. This means that we will now be investing over half of the £200 million levy back into the NHS in 2019/20. But the terms of the levy may need to change if the NHS is to provide opportunities to more clinical staff in future. We will be providing evidence to the Government’s review of the operation of the levy in 2020. 4.19. In the meantime, we will also seek to grow wider apprenticeships in clinical and non-clinical jobs in the NHS, with an expectation that employers will offer all entry-level jobs as apprenticeships before considering other recruitment options. We will continue to discuss a fair pay framework for apprenticeships with the Social Partnership Forum, balancing affordability against the need to grow these roles as quickly as we can and provide greater opportunities for people from less advantaged backgrounds to get a first foot on the NHS career ladder. Leeds Teaching Hospitals NHS Trust has exceeded the public sector apprenticeship target by offering six week traineeship with a guaranteed interview for a level one apprentice clinical support worker role, with the option of progressing through apprenticeship levels until reaching a band 5 nurse role or level 6 degree in nursing with NMC registration. North West Ambulance Service NHS Trust offers 145 apprenticeships a year, including level 4 ambulance associate practitioner apprenticeships. This has now been developed for all 10 ambulance trusts. Royal Berkshire NHS Foundation Trust developed level 6 leadership and management apprenticeships to support clinical leaders, improve the number of BAME staff in senior roles and improve staff retention. 4.20. 170,000 Allied Health Professionals (AHPs) in 14 professions work independently across the spectrum of care from primary to specialist care provision. AHPs can significantly support the demand profile the NHS faces and we have recently published 15 studies demonstrating how AHPs currently support patient flow across the whole system . The national workforce group will build on these to make specific recommendations for AHPs, in particular those in short supply – paramedics, podiatrists, radiographers, and speech and language therapists. The Chief Allied Health Professions Officer will further develop the national AHP strategy AHPs into Action to focus on the delivery of the Long Term Plan. 4.21. Pharmacists have an essential role to play in delivering the Long Term In hospitals, clinical pharmacists have for many years worked closely with other clinicians, seeing patients, taking part in ward rounds, and monitoring and reviewing treatment with medicines. In primary care, clinical pharmacists are now a key part of the general practice team in primary care networks, working alongside GPs and nurses, seeing patients and using their expertise to get the best health outcomes for people from medicines. The funding for the new primary care networks will be used to substantially expand the number of clinical pharmacists. In community pharmacy, we will work with government to make greater use of community pharmacists’ skills and opportunities to engage patients, while also exploring further efficiencies through reform of reimbursement and wider supply arrangements. 4.22. National recruitment campaigns are effective, and take pressure off individual trusts to develop local campaigns that struggle to have the same impact. In the first two months of the ‘We are the NHS’ campaign an additional 203,069 people sought out more information on a future career as a nurse, and national campaigns can be equally effective for other roles. As a commitment to helping recruit more staff, attract returners and retain those we already have, we will develop annual campaigns in conjunction with Royal Colleges and the trade unions for those roles that the NHS most urgently needs.